← TPA’s Spring Nights at Sam’s 2014 Begin! 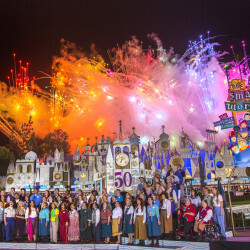 Celebrating the 50th anniversary of Disney’s “it’s a small world” theme park attraction, thousands of guests and cast members at Disney Parks around the globe united this month in a historic “It’s a Small World” sing-along. Fans everywhere joined in online at SmallWorld50.com, a “global hub” of music and harmony created for the Golden Anniversary of the iconic attraction that opened as a tribute to peace and hope, saluting UNICEF, at the 1964 New York World’s Fair. 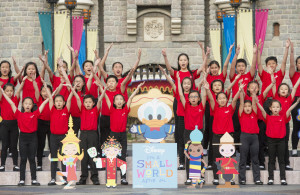 Throughout the day, Disney Parks guests participated in events in all five resorts around the world, including in-park sing-alongs, cavalcades and special musical performances. 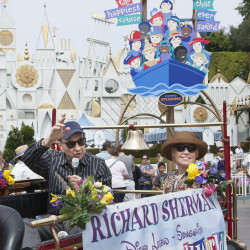 Richard M. Sherman, the Oscar-winning songwriter who composed “It’s a Small World” with his late brother, Robert, led a sing-along at Disneyland Park in California and participated in a Google Hangout that can be seen at SmallWorld50.com. Going into this month’s events, visitors from more than 150 nations had already joined the celebration at SmallWorld50.com. They have designed enough digital dolls and recorded enough videos of themselves singing the song to reach half of Disney’s goal on the site, and they will continue to play along through May 30. Disney will donate $150,000 to benefit UNICEF as part of the anniversary celebration, plus $1 for every video or doll created, up to $100,000. UNICEF works to provide health care and immunizations, clean water and sanitation, nutrition, education, emergency relief and more to children around the world. Today there are “it’s a small world” attractions at the Disneyland Resort in California (where the World’s Fair attraction was relocated in 1966), Walt Disney World Resort in Florida, Tokyo Disney Resort in Japan, Disneyland Paris in France and Hong Kong Disneyland Resort. 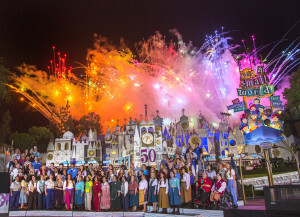 All five resorts joined in the worldwide sing-along today and held other events to commemorate the 50th anniversary. 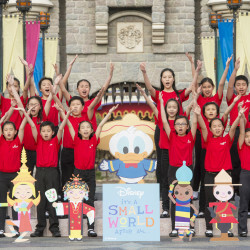 At Hong Kong Disneyland, approximately 200 resort cast members and students from Hong Kong Children’s Choir gathered in the park to sing “It’s a Small World” in Cantonese. A traditional Chinese lion dancer joined in the celebration to offer blessing for the anniversary. 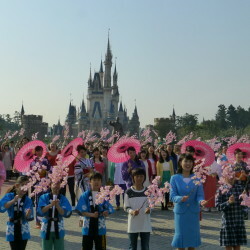 Tokyo Disneyland cast members and guests celebrated and sang the song in Japanese at Tokyo Disneyland. 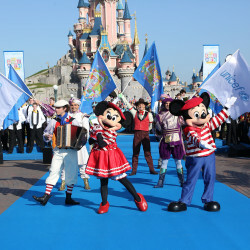 A “blue carpet” event featured the international cast members of Disneyland Paris gathered on Main Street, U.S.A., representing 100 nationalities. 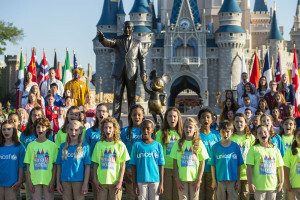 Nearly 200 international children and 50 choir performers sang a multi-language version of the iconic anthem in front of Sleeping Beauty Castle. A choir of Disneyland Resort cast members sang the song in front of the original attraction at Disneyland Park in Anaheim. Songwriter Richard Sherman chatted with fans via Google Hangout while sitting at a piano in front of the attraction. He also was scheduled to appear in a sing-along cavalcade down Main Street, U.S.A., conducting hundreds of Disneyland guests in their “It’s a Small World” sing-along. 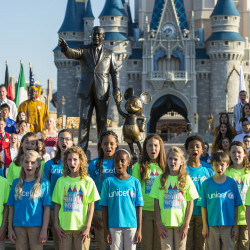 At Walt Disney World near Orlando, international cast members from the countries of Epcot led a choir of children and cast members in song in front of Cinderella Castle at Magic Kingdom Park. Also, hundreds of Magic Kingdom guests joined in the song during a special “pre-parade” before the “Disney Festival of Fantasy Parade.” Throughout the day, in-park performers – the Dapper Dans, Coke Corner Pianist, Notorious Banjo Brothers, Royal Majesty Maker Musicians and Main Street Philharmonic – are scheduled to include “It’s a Small World” in their appearances. Disney Store also joins the celebration with the “it’s a small world” doll collection, inspired by the original Fantasyland attraction, along with in-store events. Fans have visited the website from more than 150 countries – nearly 80 percent of the world’s nations – including Argentina, Australia, Brazil, Canada, China, Egypt, England, France, Germany, India, Japan, Kenya, Kosovo, Mexico, Philippines, Saudi Arabia, South Africa and Sri Lanka. Visitors to the site have recorded the “It’s a Small World” song in multiple languages, including English, Spanish, French, Italian, Japanese and Traditional and Simplified Chinese. 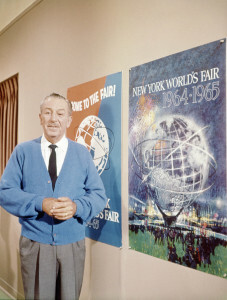 The Walt Disney Company’s relationship with UNICEF began in 1964 when Walt Disney was creating “it’s a small world” for the New York World’s Fair. More recently, Disney and UNICEF have worked together to create a brighter tomorrow for thousands of children through programming that helps foster imagination and creativity. At selected shops in Disneyland Park in Anaheim, Ca., and Magic Kingdom Park in Buena Vista, Fla., fans may purchase special “it’s a small world” 50th Anniversary pins, totes and T-shirts from April 9-13, 2014, with the entire sale price (exclusive of sales tax) benefiting UNICEF. Fans at Disneyland Paris may purchase 50th anniversary T-shirts and pins from April 10-30, 2014, with the entire sales price (excluding VAT) benefiting UNICEF. One of the most beloved attractions in the history of Disney Parks, “it’s a small world” is featured at all five Disney Resorts around the world. The original attraction premiered at the 1964 World’s Fair in New York City, created by Walt Disney himself and WED Enterprises, which eventually became Walt Disney Imagineering (the creative masters behind Disney theme parks and attractions). The attraction features a gentle boat ride through a Lilliputian land populated by colorfully dressed Audio-Animatronics dolls. They represent children from many regions of the world, all singing a song about universal harmony. A team of WED artistic geniuses, including Disney Legends designer Mary Blair and costumer Alice Davis, created the attraction’s now iconic style. In 1963, Walt Disney was asked to create an exhibit for the 1964 World’s Fair to salute UNICEF and children around the world. With Walt’s blessing, Marc Davis, one of the original Disney animators, designed the boat ride attraction through the regions and countries of the world. The first version of “it’s a small world” entertained and thrilled more than 10 million visitors in New York from 1964-65. In 1966, after some major enhancements, including an enlargement of approximately 33 percent, the attraction found a permanent home at Disneyland in California. In the attraction, hundreds of dolls “sing” the familiar song, “It’s a Small World,” in five languages (English, Italian, Japanese, Spanish and Swedish). Academy Award-winning composers Richard M. Sherman and Robert B. Sherman, who won two Oscars for their work on Disney’s feature film “Mary Poppins,” were asked by Walt Disney to create a simple, yet catchy piece that could be sung in many different languages while guests traveled by boat through the attraction. The resulting song, “It’s a Small World (After All),” became one of the most well known and happiest of all Disney tunes. This entry was posted in Home Page, Home Page Slider, News and tagged 1964 New York World’s Fair, 50th Anniversary, Alice Davis, Audio-Animatronics, Cinderella Castle, Coke Corner Pianist, Dapper Dans, Disney Festival of Fantasy Parade, Disney Parks, DISNEY STORE, Disneyland, Disneyland Paris, Disneyland Resort, Epcot, Golden Anniversary, Hong Kong Children’s Choir, Hong Kong Disneyland Resort, it’s a small world, Magic Kingdom Park, Main Street Philharmonic, Main Street U.S.A., Marc Davis, Mary Blair, MARY POPPINS, Notorious Banjo Brothers, Richard M. Sherman, Robert Sherman, Royal Majesty Maker Musicians, Salma Hayek, Sherman Brothers, Sleeping Beauty Castle, SmallWorld50.com, The View, The Walt Disney Company, Theme Park Adventure, Tokyo Disney Resort, Tom Staggs, TPA, UNICEF, Walt Disney, Walt Disney Parks and Resorts, Walt Disney World Resort, WDI. Walt Disney Imagineering, WED, WED Enterprises. Bookmark the permalink.